The annual conference of the Society for Irish Latin American Studies (SILAS), “Island Relations: Ireland, Cuba and the Latin World,” was held in Havana over four days in February. The conference coincided with the first Irish presidential visit to Cuba and the launch of novelist Joseph O’Connor’s book Star of Sea at the Havana International Book Fair. O’Connor’s book is the first work of Irish literature translated into Spanish in Cuba since James Joyce’s Ulysses 50 years ago. He referenced the faded plaque on Calle O’Reilly, written in Irish and Spanish, as evidence of the countries’ joined history. “There is so much that unites Ireland and Cuba. Tenemos tanto en común. Irish and Cuban people have in common a proud sense of their national identity, a passion for freedom, as well as remarkable achievements in the boxing ring! In the past, both of our people have shared an experience of living in the shadow of a powerful neighbor. We are two island nations who have been marked by colonization and that have had to wrestle their freedom from the grip of empires,” he said. During his visit, the Irish president also inaugurated the Irish Department of Foreign Affairs international touring exhibition, curated by SILAS president Margaret Brehony, on the Irish in Latin America. Brehony, whose conference paper dealt with Irish migrant families who came to Cuba in the early 1800s as part of a white colonization strategy in the context of expanding plantation slavery, was one of many academics who lectured on Latin American countries where the Irish left their imprints. Academics from Argentina, Brazil, Cuba, Columbia, Ireland, Mexico, Peru, Puerto Rico, Spain, and the United States, along with Joseph O’Connor and writer Colm Tóibín, gave presentations. Professor Nuala Finnegan of University College Cork interviewed Pura López Colomé, a Mexican poet and translator of Irish Nobel Laureate Seamus Heaney, about her relationship with Heaney and Ireland. Rafael Moya, a Cuban ex-diplomat, spoke about prominent families of Irish descent and their legacy in the social, economic, and literary spheres in Cuba. Historically, many of the Irish who came to Cuba were involved in the construction of the railway in 1902, but there were also much earlier influences, including one family involved in the notoriously lucrative slave trade. Julio David Rojas Rodriguez of the University of Havana presented new evidence about the clandestine slave trading expeditions by members of the wealthy O’Farrill family in Cuba. Originally from Longford, the O’Farrills were owners of sugar plantations, sugar mills, tobacco plantations, cattle ranches, and hundreds of slaves. Today, two splendid mansions in the Old Havana area of the country’s capital, Hotel O’Farrill and the present home of the Archbishop of Havana, survive the family. The conference took place at Palacio de Segundo Cabo on Calle O’Reilly. 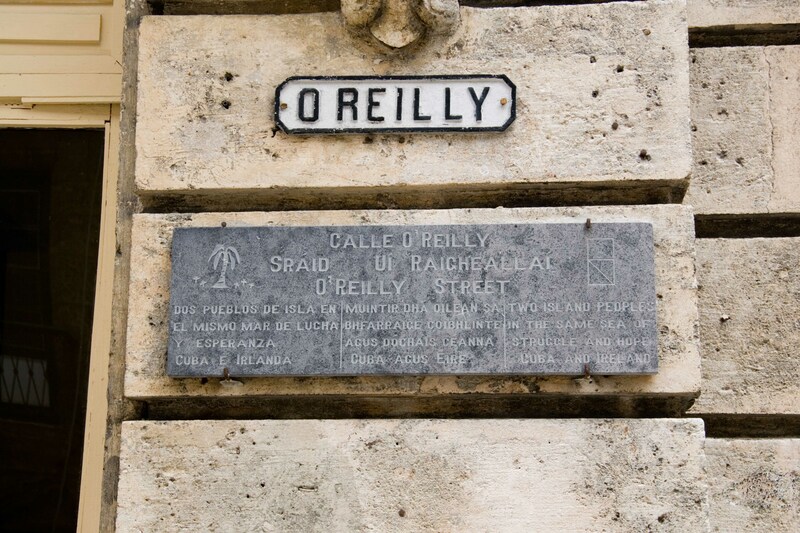 One of the oldest streets in Old Havana, it was named for General Alejandro O’Reilly, originally from Baltrasna, County Meath, but raised in Spain. Alejandro restructured all of the military defenses in Havana and throughout Cuba. One of the many Irish serving in the Spanish Army, O’Reilly arrived in Cuba on July 3, 1763 when Spain regained the city of Havana from the English in exchange for Florida. What a fabulous article. So glad I was able to read it. With the last name Reilly it always makes it more interesting. The author did a wonderful job. I am Cuban and my last name is Oconor, derived from the Irish name O’Connor. I would like to know more about my name and how it made it to Cuba. Where can I find more information?